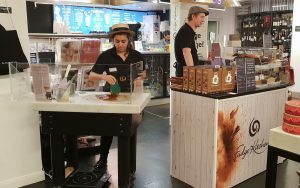 Who could have foreseen that a chance visit to our Cambridge shop, minutes before closing time, would leave one customer so blown away by our fudge and by the wonderfully attentive and engaging staff there that it would result in a pop-up in the world’s leading luxury retailer? Who could have known that the pleased-as-punch-punter was, in fact, Jose Collado, the Food & Wine Retail Manager of Harvey Nichols, who would later invite us to take up residence in their famous Foodmarket? And they seem to be doing just that! Since setting up on 5thNovember, Harvey Nichols’ discerning customers are being equally drawn in by the famous Fudge Kitchen experience; watching demos of authentic fudge making, drooling over the kaleidoscopic rows of creamy slices in the Fudge Bar, sampling a-plenty and listening to the Dan the Fudge Man’s cheerful banter. Even MD, Sian Holt, has been spotted in a Fudge Kitchen pinny, serving up slabs of handmade fudge. The pop-up will run every day, to shop hours, until 23rdDecember and stocks a selection of products perfect for Christmas gifts, from Drinking Fudge selection boxes, including a dairy free option, to Fudge Making kits and our ideal stocking filler, luxury caramels and brittles. Plus … a Fudge Bar. Yes, you heard right …! The pop-up offers a pick-and-mix selection of sixteen flavours of our original ‘slab’ fudges, made to a traditional 1830’s core recipe, using the authentic “slabbing and loafing” technique on marble counters, that is the secret to that dreamily creamy core. 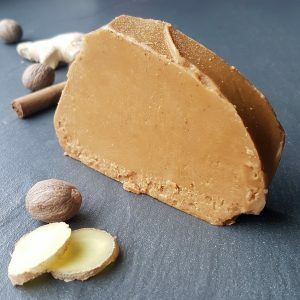 The Harvey Nichols line-up will include best sellers Sea Salted Caramel, Belgian Swirl and Classic Butterscotch Fudge, a range of festive flavours, including Mince Pie, Rum & Raisin, Christmas Pudding, Chocolate & Orange; and a selection of vegan-friendly flavours, so that no one misses out on the fun. If you are visiting London for your Christmas shopping, come and visit us on the 5thfloor and try some. And if you’re doing the rounds, or are a serial Father Christmas Grotto visitor, you’ll also find Fudge Kitchen products in those other great Christmas meccas (if that isn’t too culturally contradictory), Selfridges and Harrods. Can we say it yet … why the heck not … Merry Christmas, everyone!